The Garden of the Righteous of Milazzo has been inaugurated in 2011 on the initiative of the associations Il Giglio and Libera of Don Ciotti. 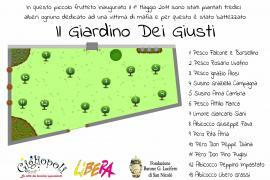 The Garden hosts fruit trees and is dedicated to everyone who stands up against mafia. The ceremony was attended by local authorities, families of honoured Righteous, everyone who is locally involved in activities and actions against mafia, representatives of Libera, and the Scouts, who performed a choir show. During the ceremony, the direct testimonies of those who fight the mafia in Sicily have been told. In 2012, the Garden of "Responsabili" has been inaugurated with 70 fruit trees in honour of those who fight everyday the mafia with small acts: those people are journalists, priests, associations and armed forces. In the orchard, the only tree with a name is the one dedicated to Gaetano Saffioti. He is an entrepreneur from Calabria who reported his extortioners and helped the judiciary to comprehend the perverted mechanisms that link the 'ndrangheta to the construction industry.